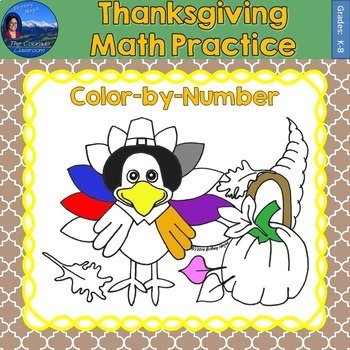 Math practice is a joy with this Thanksgiving themed color by number picture available in a multitude of skills. Differentiate for the students in your room but grade it in a snap, as all sheets work out to the same answer key. 30 problems are included per sheet. You will receive 13 PDF files and 1 All in One Downloadable PDF bonus file which also includes a blank, black line master of the drawing. 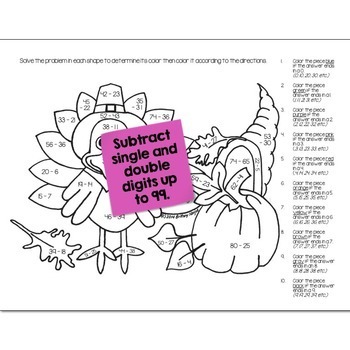 Grades 5-8 Thanksgiving Math Practice Bundle. * Look for the green star next to my store logo and click it to become a follower. * Be the first to know about my new discounts, freebies, and product launches. * Receive email updates about this store.